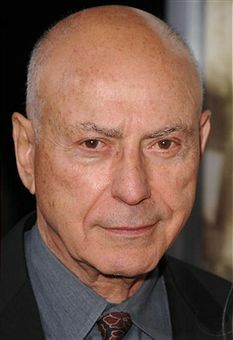 Alan Wolf Arkin (born March 26, 1934) is an American actor, director, musician and singer. He is known for starring in such films as Wait Until Dark, The Russians Are Coming, the Russians Are Coming, The Heart is a Lonely Hunter, Catch-22, The In-Laws, Edward Scissorhands, Glengarry Glen Ross, Thirteen Conversations About One Thing, Little Miss Sunshine, and Argo, the last two of which he was nominated for the Academy Award for Best Supporting Actor and the former of which he won. He is the father of actors Adam Arkin, Anthony Arkin, and Matthew Arkin. Bald of Awesome: Tends to play a no-nonsense Cool Old Guy. Cool Old Guy: He commonly plays chummy old guys in his elder years. He Also Did: Was a member of The Tarriers , a Folk Music group that had a couple hits in The '50s. Disowned his involvement in the film Freebie and the Bean in 1974, saying he had only accepted the role because, "he needed the bread.". Attempt to bring up the film where he played Inspector Clouseau, and he'll express deep embarrassment. He said once he was becoming a rather egotistical actor during that time period, and foolishly thought he'd become the next Clouseau. His absolute failure in the role (and the entire film in general), made him more humble. What Could Have Been: He was originally slated to play Saul Bloom in Steven Soderbergh's remake of Ocean's Eleven in 2001.; after dropping out of the production, he was replaced by Carl Reiner. Arkin won a 1963 Tony Award as Best Featured Actor in a Play as well as a Theatre World Award playing a character based on Carl Reiner in the Broadway production of Reiner's autobiographical novel Enter Laughing in 1967.